Major Jackson is the author of four books of poetry, including Roll Deep (2015), Holding Company (2010), Hoops (2006) and Leaving Saturn (2002), which won the Cave Canem Poetry Prize for a first book of poems. He is the editor of Library of America’s Countee Cullen: Collected Poems. 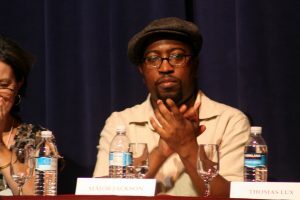 A recipient of fellowships from the Fine Arts Work Center in Provincetown, Guggenheim Foundation, National Endowment for the Arts, and the Radcliffe Institute for Advanced Study at Harvard University, Major Jackson has been awarded a Pushcart Prize, a Whiting Writers’ Award, and has been honored by the Pew Fellowship in the Arts and the Witter Bynner Foundation in conjunction with the Library of Congress. He has published poems and essays in American Poetry Review, Callaloo, The New Yorker, The New York Times Book Review, Paris Review, Ploughshares, Poetry, Tin House, and included in multiple volumes of Best American Poetry. Major Jackson lives in South Burlington, Vermont, where he is the Richard Dennis Green and Gold University Distinguished Professor at the University of Vermont. He serves as the Poetry Editor of The Harvard Review.